DigNittany: We’ve been hearing a lot about how Oregon runs such a fast offense that it will leave Penn State’s middles — 6-6 Jr. Katie Slay and 6-2 So. Nia Grant — gasping for breath as they struggle to close to the pins. At the same time, many observers have said that a significant factor in Michigan’s 3-1 upset win over #2 seed Stanford was Michigan’s quick-set offense. Penn State defeated Michigan 3-2 in Ann Arbor this season, so they’ve had success against a fast tempo offense. Here’s our question: Is Oregon’s offense markedly faster than Michigan’s, are they comparable, or are they different in other ways that make the comparison not useful? Club Coach: I think Oregon poses a great challenge for PSU. Normally in preparing for great teams, your focus is on their players, and their tendencies. With Oregon, it’s about their tempo, their ability to spread you out, and stress you from pin to pin, so you’re preparing for a system more so than individuals. It’s very difficult to create that tempo in practice if that isn’t what you yourself do. Although Michigan goes quick, Oregon has stronger attackers, and goes to more people than Michigan does. Oregon is a big jump from Michigan in my opinion. Penn State, however, does things that will make it difficult for Oregon to do what they do well. It is very hard to transition and go quick versus a team that can kill the ball the way that Penn State does. Ironically, I think this match is as much or more about how well Penn State attacks than how it defends. Although I’m sure some would disagree with me, I believe the keys to the match are Oregon’s defense, and Penn State’s offense. Oregon is a team you have to dictate to – if you are trying to respond or adjust to what they’re doing, you’re in trouble. 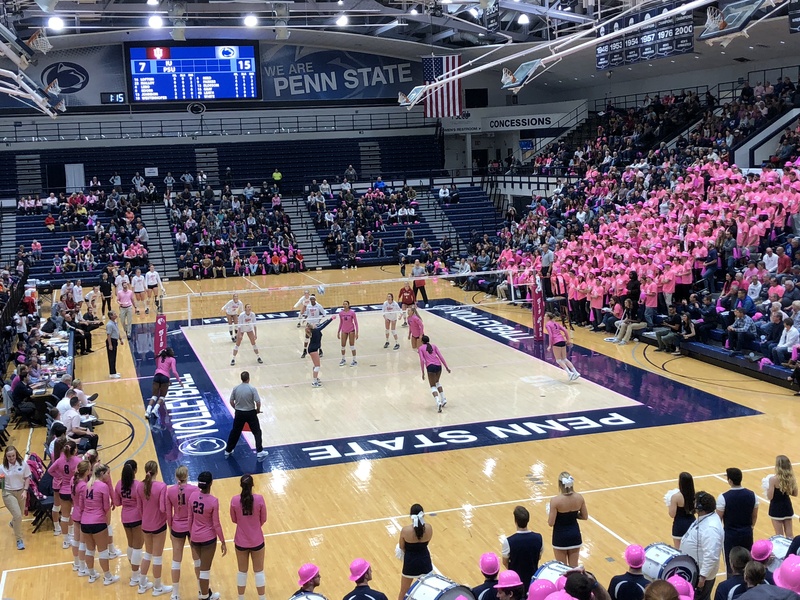 Penn State needs to get after them with the serve, and has to kill the first ball at a high level to be successful – both of which are things they’ve been very successful doing. DigNittany: Oregon’s 5-9 setter Lauren Plum is very highly regarded — she was the 2012 Pac-12 Setter of the Year. What can you tell us about Plum and the challenges she presents to the Nittany Lions. Club Coach: Plum is a great player, she is talented, and she is fearless. She isn’t operating out of any pattern or script, which makes her very hard to prepare for. She likes to push the envelope and does a great job of putting defenses on their heels. She has a great sense for whom to get the ball to, and has a gunslinger mentality. DigNittany: Another key player for Oregon is Pac-12 Player of the Year, 6-3 RS Sr.OH Alaina Bergsma, who totaled a match-high 23 kills against Nebraska (hitting .429, with only two errors in 49 attacks). She has led the Ducks in kills 22 times this season. What stands out to you about Bergsma’s play, and how does she compare to Penn State’s 6-4 Jr. Opp/RS Ariel Scott (aside from the fact that she’s an OH and Scott plays Opp/RS)? Club Coach: Bergsma is hands down the best player PSU will have faced all year. She is big, see’s the court, and is really good in the clutch. She has had incredible matches offensively versus the best teams in the country, and her performance in Omaha against a great defensive team speaks for itself. I’m sure going into the match, PSU knows they aren’t going to stop her. You can do everything right, and she will still get her kills. PSU needs to do their best to manage her, and focus on shutting down the players they can. Scott is great essentially for the same reasons. No matter how you defend her, she still scores because of her size, vision, and the ability to go up top with a lot of heat. You’re gonna see those two thump some balls, I can assure you of that. DigNittany: Statistically, Penn State is a much better blocking team than Oregon. To date, the Ducks have averaged 1.78 blocks/set compared to 2.78 blocks/set for its opponents, and Penn State has averaged 2.95 blocks/set compared to 1.77 blocks/set for its opponents. Blocking is always important, but given the disparity, and Oregon’s fast offense, will blocking be even more important on Thursday? Club Coach: Oregon is not an exceptional blocking team in terms of points scoring. Blocking stats really just illustrate how often you block for points, and that doesn’t tell the whole story. Oregon touches a lot of balls, and although that doesn’t directly lead to a point, their transition game is so good, they do a lot of point scoring off those touches. In the end, their block allows them to score, just not directly in a way that is measured statistically. This is why I believe PSU’s offense is the key for them to win. If they are able to put the ball down quickly, it prevents Oregon from doing what they do best, which is attack in transition. This has the makings of not just a great match, but a really interesting one. DigNittany: Thanks for your time. We appreciate it. Go Lions!